As many of you know, Easy Apply is an AMAZING feature on LinkedIn that I’ve talked about many times before. When companies post jobs on LinkedIn, they have two options: 1. to direct applicants to their own sites (and/or systems) so they can apply there OR 2. to collect applications right in the LinkedIn system. If they want to do the second option and allow people to use a profile to apply, they can allow the Easy Apply feature, as shown below. From a job seeker’s perspective, this basically allows you to apply for a job in two clicks (it literally takes five seconds). As a career coach, I LOVE this feature for my clients – it’s super easy and efficient. As someone who recruits, I would say I have a love/hate relationship with Easy Apply. The good thing is that you get a lot of applicants fast. The downside is that the process is so easy that you end up getting a lot of applicants who may not even care about your job. Here’s how you can make an effort to make sure your Easy Apply app still impresses and shows effort. 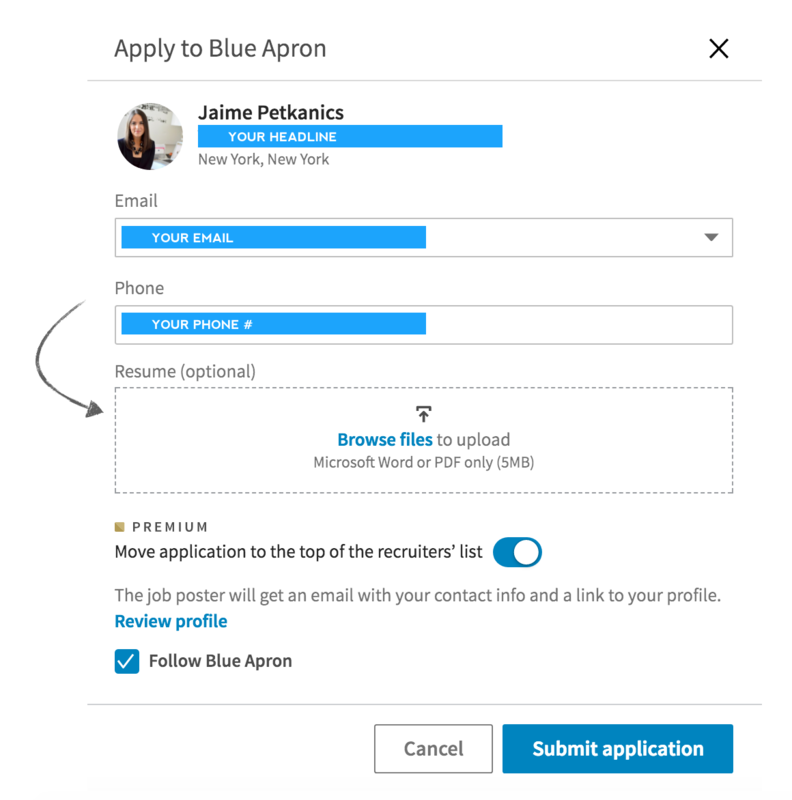 When you use this feature, you’ll see that you have the option to attach your resume before submitting. You should always do this! The process is already so easy so from the recruiter’s perspective, I always wonder why someone wouldn’t take the super simple extra step to attach their resume. This also allows you to curate your professional experience to a single job, which is obviously tougher to do on an outward facing profile. More to come on that shortly. 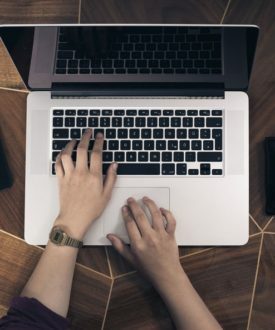 While recruiters may eventually make their way to your resume, the first thing they will be looking at on the back end is your LinkedIn profile. So if you’re going to use the Easy Apply feature, your profile better be in not good, but GREAT, shape. This means that you have a nice and professional photo, your relevant jobs are all listed with accurate dates and titles, and that you have keyword rich descriptions attached to each (this one is really important so I suggest checking out this article to write them). When recruiters are screening for a specific job, they’re not just looking for someone who can do the job – they’re looking for someone who also has a passion for it and a track record of doing similar things. This is not just because they will be better at it but because companies want to retain people after they hire them. 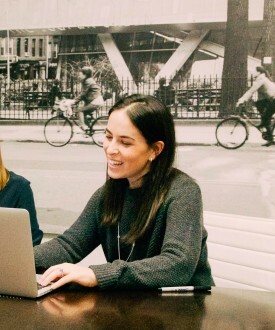 If I’m hiring for a PR Coordinator and your passion is in digital marketing, you’re probably not going to hang out in the job for too long before you get bored (even if you’re very much qualified). So if you’re applying to that Digital Marketing role and your profile summary says that you’re passionate about pursuing a career in PR, that’s not going to work to your advantage. LinkedIn is tricky like that – you don’t have the ability to customize your profile to each and every job like a resume or cover letter. The key to doing this step well is to first figure out what you really want out of your next career move. The more focused you can be, the better (within reason). The next step is to curate your profile to align with those types of jobs and then obviously, to also spend your time and energy applying to those types of jobs. If you’re really not sure what’s next and you want to apply to lots of different types of jobs on LinkedIn, your best option is to make your profile slightly more generic and then spend your energy customizing your resume. On that same note, you still do have the ability to customize your resume to different jobs and you absolutely should (especially if you’re using Easy Apply with a more generic profile). If you’re really excited about a job and looking to stand out, you can even write a cover letter sharing your interest in the job and company and PDF that with your resume so that it’s a single document to upload. At the end of the day, when you use this feature, recruiters don’t have the ability to learn much about you beyond your profile and resume. If you have a super relevant background for the job, that will be enough, but if not, you may need to go above and beyond. Are you guys sick of me talking about cold emails yet? I believe in follow up emails so much because I’ve seen them work over and over and over again. If a company gets 500 applications through Easy Apply and then a few people (who are qualified, that’s one of my criteria for cold emailing) follow up with a thoughtful note, that will make them stand out from the crowd, guaranteed. If someone from the company attaches their profile to a job posting, I promise they don’t mind if you reach out. And if not, you can do your research to find the right person. As I always say, the worst thing that can happen is someone ignores you. The best thing that can happen is that you land the interview. So go for it! That’s it for now – so go forth, and Easy Apply!